We also have a hall at all four churches if you would like a place to gather after the funeral. Please call the office at #847-6890 and we can help answer any questions you may have. As you plan the funeral of your loved one, we hope that your experience will be filled with much support and care. Your participation in the planning process will allow the Parish of the Holy Eucharist to personalize the Liturgy. A Catholic funeral is structured in such a way as to invite participation by those closest to the deceased. In this way, memories are created as we fulfill the corporal work of mercy by burying the dead and the spiritual work of mercy of praying for the dead. If you are being assisted by the service of a funeral director, the funeral director will contact the Parish of the Holy Eucharist in your behalf to schedule the funeral: wake, Mass and burial. If you have chosen cremation and are using the service of a funeral director only to arrange for the cremation, you will be in direct contact with the Parish of the Holy Eucharist. During the work week (Monday-Friday), the Parish Secretary of the Parish of the Holy Eucharist will work with you to coordinate the funeral of your deceased loved one. 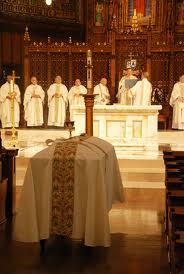 On weekends and holidays, please contact the priest on call, who will work with you to coordinate the funeral. The Parish of the Hoy Eucharist’s phone number is 207-847-6890. .00. This fee includes the use of the church and the services of organist and cantor. The Parish of the Holy Eucharist has a cemetery (Holy Cross Cemetery in Yarmouth, ME). The Parish Secretary can provide information regarding the availability of graves. The parish has a form to guide your planning of the funeral. You may download a copy of the form at the following link: Funeral Planning Form, or you can contact the office for a copy. Using the Funeral Planning Form, you are asked to choose one option from Sections C and E and also provide the name of person who will be reading each reading. NOTE: The parish could provide parishioners who could read in the event that there is no one from the family who would like to read. Following the homily, a family member or friend may read the General Intercessions. A copy is provided at the following link: Intercessions. NOTE: The parish could provide parishioners who could read in the event that there is no one from the family who would like to read. Once the Funeral Planning Form is completed, it is reviewed with the priest or deacon. Please inform the person celebrating the funeral if there will be any Military honors or Civic Groups present such as the Knights of Columbus, VFW or Lyons Club.